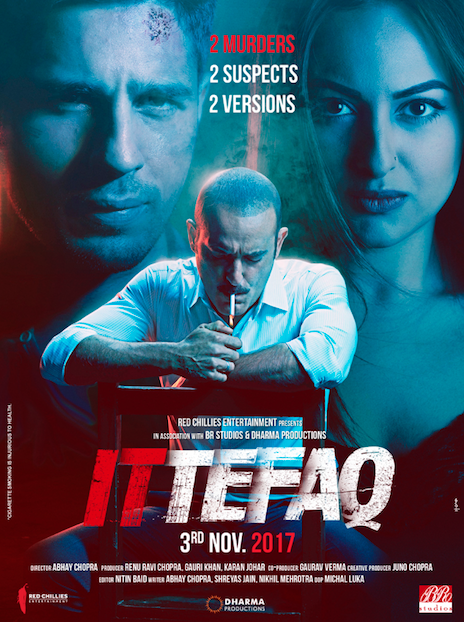 The much-awaited trailer of Sonakshi Sinha and Sidharth Malhotra starrer Ittefaq is out now. The film revolves around two murders, which puts Vikram, played by Sidharth, and Maya, essayed by Sonakshi, under the limelight of what happened that night. The trailer takes the audience through the duo’s journey on the night that turns their lives around. Enters Akshaye Khanna, who play’s a cop on mission to solve the case. “There are three versions of the story. His side. Her side. And the truth. We have to find the truth,” he proclaims in the trailer. Dev (Akshaye Khanna), a police officer, is investigating a double murder case that has only two witnesses, who are also the prime suspects. The suspects – Vikram (Siddharth Malhotra), an acclaimed writer, and Maya (Sonakshi Sinha), a young homemaker, have different narratives about the events of that fateful night. Both the stories seem true but there can be only one truth. Dev is torn between the two versions of the story, and will not settle till he finds out what happened that night. The crime thriller has been co-produced by Red Chillies Entertainment, Dharma Productions and BR Studios and is directed by B.R. Chopra’s grandson, Abhay Chopra. 16 queries in 0.712 seconds.